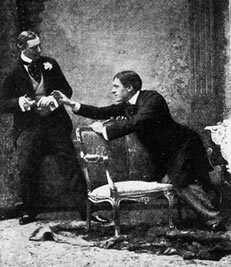 ACT I. Algernon Moncrieff’s Flat in Half-Moon Street, W.
Algernon: I’m sorry for that, for your sake. I don’t play accurately—any one can play accurately—but I play with wonderful expression. As far as the piano is concerned, sentiment is my forte. I keep science for Life. Algernon: [Inspects them, takes two, and sits down on the sofa.] Oh! . . . by the way, Lane, I see from your book that on Thursday night, when Lord Shoreman and Mr. Worthing were dining with me, eight bottles of champagne are entered as having been consumed. Algernon: Lane’s views on marriage seem somewhat lax. Really, if the lower orders don’t set us a good example, what on earth is the use of them? They seem, as a class, to have absolutely no sense of moral responsibility.